It is a challenging task to model the emerging high-dimensional clinical data with survival outcomes. For its simplicity and efficiency, penalized Cox models are significantly useful for accomplishing such tasks. hdnom streamlines the workflow of high-dimensional Cox model building, nomogram plotting, model validation, calibration, and comparison. To build a penalized Cox model with good predictive performance, some parameter tuning is usually needed. For example, the elastic-net model requires to tune the \(\ell_1\)-\(\ell_2\) penalty trade-off parameter \(\alpha\), and the regularization parameter \(\lambda\). In the next, we will use the imputed SMART study data to demonstrate a complete process of model building, nomogram plotting, model validation, calibration, and comparison with hdnom. The dataset contains 3873 observations with corresponding survival outcome (time, event). 27 clinical variables (x) are available as the predictors. See ?smart for a detailed explanation of the variables. ##  "model"       "alpha"       "lambda"      "model_init"  "alpha_init"
##  "lambda_init" "pen_factor"  "type"        "seed"        "call"
Adaptive elastic-net includes two estimation steps. The random seed used for parameter tuning, the selected best \(\alpha\), the selected best \(\lambda\), the model fitted for each estimation step, and the penalty factor for the model coefficients in the second estimation step are all stored in the model object fit. 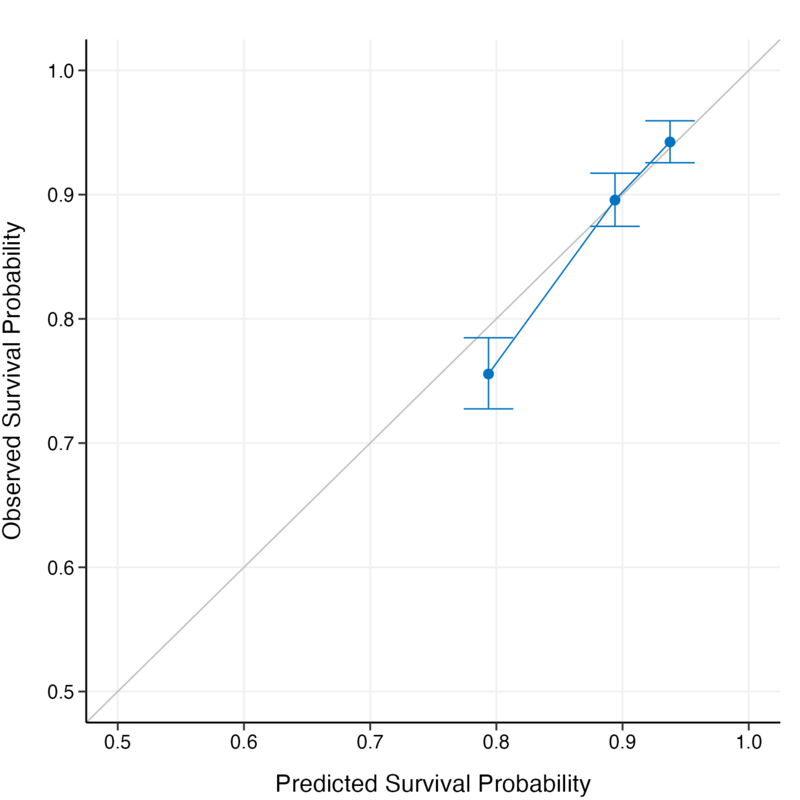 funlabel = "2-Year Overall Survival Probability"
According to the nomogram, the adaptive elastic-net model selected 6 variables from the original set of 27 variables, effectively reduced the model complexity. Information about the nomogram itself, such as the point-linear predictor unit mapping and total points-survival probability mapping, can be viewed by printing the nom object directly. It is a common practice to utilize resampling-based methods to validate the predictive performance of a penalized Cox model. Bootstrap, \(k\)-fold cross-validation, and repeated \(k\)-fold cross-validation are the most employed methods for such purpose. hdnom supports both internal model validation and external model validation. Internal validation takes the dataset used to build the model and evaluates the predictive performance on the data internally with the above resampling-based methods, while external validation evaluates the model’s predictive performance on a dataset which is independent to the dataset used in model building. 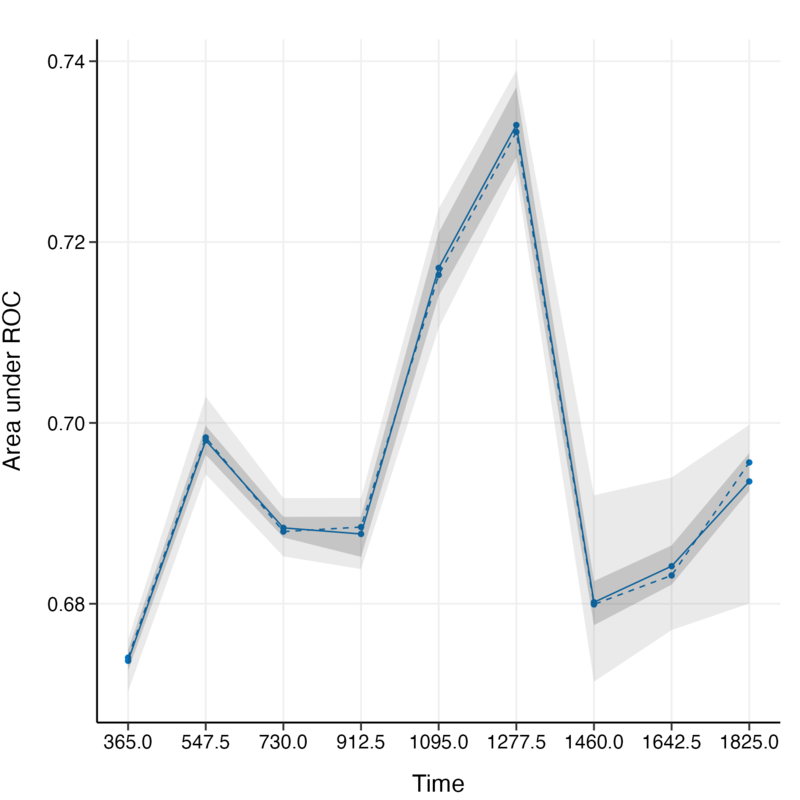 validate() allows us to assess the model performance internally by time-dependent AUC (Area Under the ROC Curve) with the above three resampling methods. The mean, median, 25%, and 75% quantiles of time-dependent AUC at each time point across all bootstrap predictions are listed above. The median and the mean can be considered as the bias-corrected estimation of the model performance. The solid line represents the mean of the AUC, the dashed line represents the median of the AUC. The darker interval in the plot shows the 25% and 75% quantiles of AUC, the lighter interval shows the minimum and maximum of AUC. It seems that the bootstrap-based validation result is stable: the median and the mean value at each evaluation time point are close; the 25% and 75% quantiles are also close to the median at each time point. Bootstrap-based validation often gives relatively stable results. Many of the established nomograms in clinical oncology research are validated by bootstrap methods. \(K\)-fold cross-validation provides a more strict evaluation scheme than bootstrap. Repeated cross-validation gives similar results as \(k\)-fold cross-validation, and usually more robust. These two methods are more applied by the machine learning community. Check ?hdnom::validate for more examples about internal model validation. Now we have the internally validated model. To perform external validation, we usually need an independent dataset (preferably, collected in other studies), which has the same variables as the dataset used to build the model. For penalized Cox models, the external dataset should have at least the same variables that have been selected in the model. The time-dependent AUC on the external dataset is shown above. Measuring how far the model predictions are from actual survival outcomes is known as calibration. Calibration can be assessed by plotting the predicted probabilities from the model versus actual survival probabilities. Similar to model validation, both internal model calibration and external model calibration are supported in hdnom. calibrate() provides non-resampling and resampling methods for internal model calibration, including direct fitting, bootstrap resampling, \(k\)-fold cross-validation, and repeated cross-validation. We split the samples into three risk groups. In practice, the number of risk groups is decided by the users according to their needs. The model calibration results (the median of the predicted survival probability; the median of the observed survival probability estimated by Kaplan-Meier method with 95% CI) are summarized as above. In practice, you may want to perform calibration for multiple time points separately, and put the plots together in one figure. See ?hdnom::calibrate for more examples about internal model calibration. The external calibration results have the similar interpretations as the internal calibration results, except the fact that external calibration is performed on the external dataset. Internal calibration and external calibration both classify the testing set into different risk groups. For internal calibration, the testing set means all the samples in the dataset that was used to build the model, for external calibration, the testing set means the samples from the external dataset. The \(p\)-value of the log-rank test is also shown in the plot. ## n=3872, 1 observation deleted due to missingness. ## n=999, 1 observation deleted due to missingness. The exact \(p\)-values for log-rank tests are stored as cal_int_logrank$pval and cal_ext_logrank$pval. Here \(p < 0.001\) indicates significant differences between the survival curves for different risk groups. Given all the available model types, it is a natural question to ask: which type of model performs the best for my data? Such questions about model type selection can be answered by built-in model comparison functions in hdnom. The solid line, dashed line and intervals have the same interpretation as above. 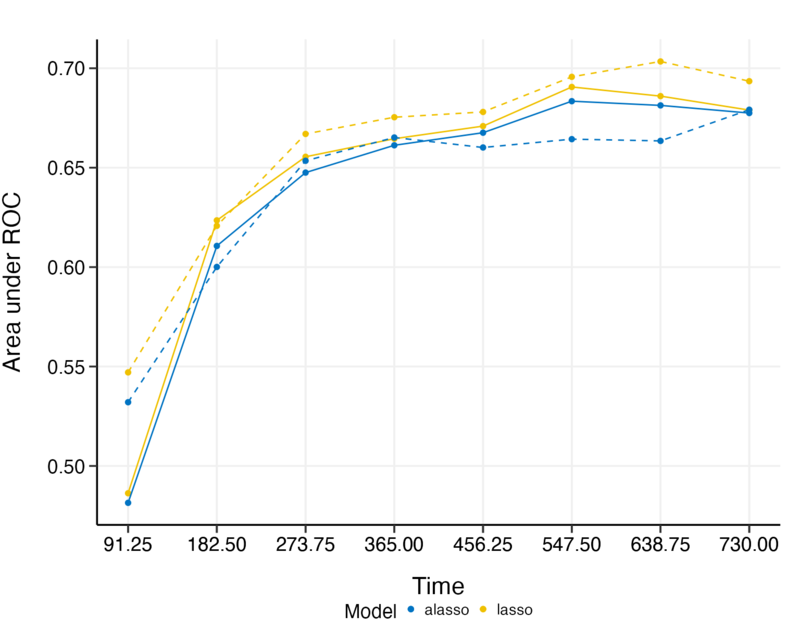 For this comparison, there seems to be no substantial difference (AUC difference \(< 5\%\)) between lasso and adaptive lasso in predictive performance, although lasso performs slightly better than adaptive lasso for the first three time points, adaptive lasso performs slightly better than lasso for the last few time points. The model comparison functions in hdnom have a minimal input design so you do not have to set the parameters for each model type manually. The functions will try to determine the best parameter settings automatically for each model type to achieve the best performance. The summary output and the plot show the calibration results for each model type we want to compare. 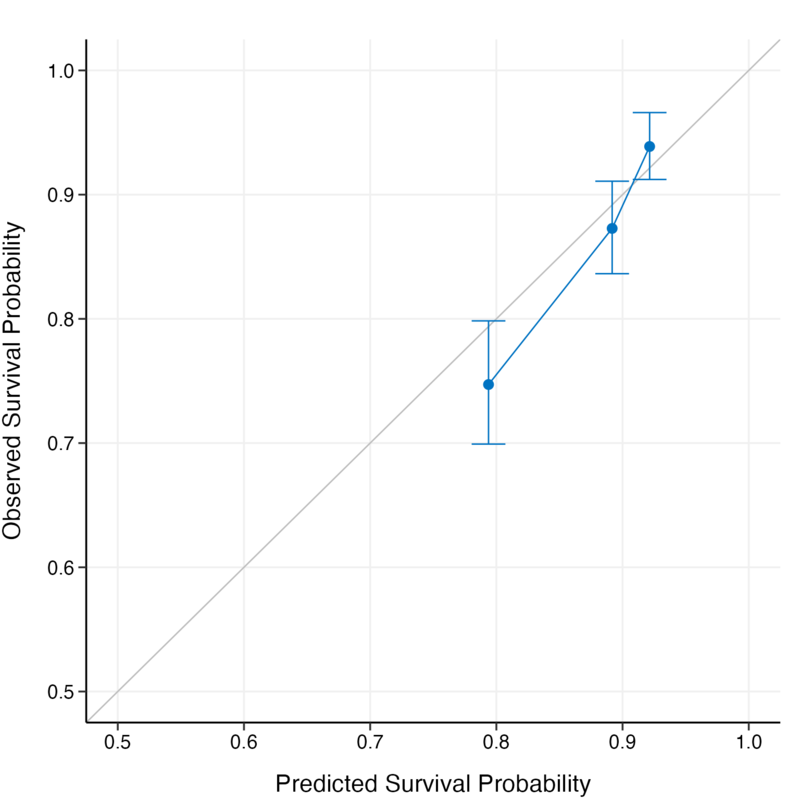 Lasso and adaptive lasso have comparable performance in this case, since their predicted overall survival probabilities are both close to the observed survival probabilities in a similar degree. Adaptive lasso seems to be slightly more stable than lasso in calibration. To predict the overall survival probability on certain time points for new samples with the established models, simply use predict() on the model objects and the new data. By default, hdnom will use the JCO color palette (col.pal = "JCO").